The best books of 2016, meaning that I read. Hector and Agamemnon. Slope sees slope. Funny, brutal, tough, with armies that “Moved out, moved on, and fell in love with war again” (82). Quite likely gibberish without a pretty decent knowledge of Homer. That the book is a fragment only roots it more firmly in its epic tradition. 2. I completed a re-read – mostly “re-” – of Anton Chekov’s short stories in the thirteen-volume Constance Garnett translation. Paying some non-neurotic, I hope, attention to chronology, I was mostly past the earlier, shorter, simpler stories; however good that stuff can be, this year it was “The Steppe” (1888) and “Ward No. 6” (1892) and so on, ending last week with “Peasants” (1897), “The Lady with the Dog” (1899), and “In the Ravine” (1900), examples of the greatest fiction ever written. I guess the plays will have to wait for next year’s list. 3. This was the year I took Oscar Wilde seriously, reading his short fiction, novel, plays, a volume of criticism, and a 1,200 page book of letters – not everything he wrote, but a lot, and with the exception of The Importance of Being Earnest, which even Wilde saw as a freak, none of these books were as interesting on their own as they were together. The meta-story of Wilde as artist, prisoner, and exile was a great story. I had a similar experience with Mark Twain, where even some pretty trivial pieces became more interesting as part of the Mark Twain story. And then once in a while he writes a masterpiece, just to keep my attention. 4. The most famous books I read for the first time were The Return of the Native and Tess of the d’Urbervilles, The Bostonians and What Maisie Knew, Pudd’nhead Wilson and Life on the Mississippi, The Adventures of Sherlock Holmes and The Hound of the Baskervilles, and to get away from English, Nana and La Regenta (famous in Spain, anyways – many thanks to everyone who gave a shot at the readalong). None of these are among my favorites, exactly, but finally, finally. 5. Similarly, I finally read The Education of Henry Adams – “greedily devoured it, without understanding a single consecutive page” (Ch. 31), as Adams says about his own reading. This would have been the perfect book with which to close out a 19th century book blog, but I did not know enough to plan that well. Maybe I’ll write about this book next year. 6. As for poetry, I spent the year cramming poems of the 1910s (and earlier, and sometimes later) down my gullet like I was a goose fattening my own liver. Stefan George, Stephen Crane, Walter de la Mare, Ezra Pound, G. K. Chesterton, T. S. Eliot, H. D., Anna Akhmatova, Osip Mandelstam, Isaac Rosenberg, Robert Frost, Thomas Hardy, Edward Thomas, and many more. Four books by Edwin Arlington Robinson. Four books by Vachel Lindsay. So much great, good, bad, crazy poetry. Welcome to Modernism. The movement from poet to poet and from year to year was as exciting as almost anything an individual poet was doing. Finishing one book, however good, I moved to another. I wanted to see what happened next. I still do. There is no way my poetry-liver is absorbing these poems well. I feel like an undergraduate again, tearing through the poetry section of my Norton Anthology of American Literature – what is this – what is this? Absolutely terrific fun. Wuthering Expectations will be on a holiday break for a couple of weeks, and back in early January for more good books. I usually do not mess around with a “best of a hundred years ago” post, however fun it might be, because I am too ignorant to make basic judgments. To the best of my knowledge, for example, I have read no more than four novels from 1916: James Joyce’s A Portrait of the Artist as a Young Man, Sholem Aleichem’s cheery Motl the Cantor’s Son (I think just the second half, Motl in America, is from 1916), Gustav Meyrink’s well-titled Bats, and L. Frank Baum’s Rinkitink in Oz. However easy it is to pick out the best book from this group – Rinkitink is awesome – I do not have a good sense of what other novels are in contention. But this year I have been reading a lot of English-language poetry from 1916 – eight or ten books depending on how I count – plus, recently, plenty of individual poems from French, Italian, German, and Russian from various collections, so I thought I would pull some of them together. Maybe just the books, to make my task easier. Here’s an end to my art! The old forms are good enough for war poetry. You are very idle, my songs. Which is not really how it seems, reading the poems and their mixture of ancient Greek, classical Chinese, and now. Make it new, make it new, as explicitly as possible, in this year of the birth of Dada. Even for Pound, though, “newness” was less a goal of its own than a search for a voice, which is closer to what I see in 1916. Many poets, not all but many, found the old poetic modes inadequate, at least not them, thus all the improvisation, innovation, and flailing about. What, in Amores, is D. H. Lawrence trying to do that is new other than express himself? But oh, it is not enough, it is all no good. Me its life as it hurries in secret. I am not sure that is good, but is it ever Lawrence. Their flavors are not as strong as Lawrence’s, but H. D. is working on a similar problem; so are Isaac Rosenberg (Moses) and Conrad Aiken (The Jig of Forslin, A Symphony and Turns and Movies). Edwin Arlington Robinson (The Man against the Sky) has already found a strong voice. Robert Frost is only on his third book, Mountain Interval, but it feels as if he had been Frost forever. Maybe I should have started this post with Frost. What a confident poet. And, I remind myself, I have heard poets singing just as loudly in Russian, German, Italian, and French. The list is long; the idea of “best” becomes moot. The best book of 1866 is so obvious that it is barely worth disagreeing, but as Raskolnikov says himself, “The wrong form, you mean – the aesthetics aren’t right!” (VI.7, tr. Oliver Ready). My favorite book of 1866 is not Crime and Punishment but Victor Hugo’s staggering and preposterous man-against-nature – man-against-hurricane – man-against-octopus – epic The Toilers of the Sea, illustrated above. 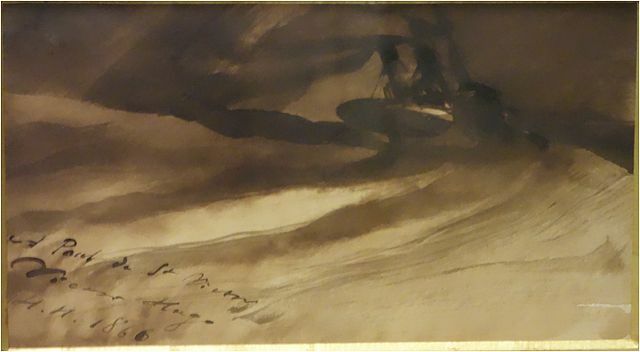 The steamboat pictured is about to get stuck on a strange rock formation, and the hero will spend most of the novel fighting everything Hugo can throw at him to get it moving again. “Then, taking up in the hollow of his hand a little water from a pool of rainwater, he drank it and cried to the clouds: ‘Fooled you!’” That’s right, he is insulting the clouds, defying the cosmos, as one does in a Victor Hugo book. Dostoevsky wrote The Gambler this year, too, alongside Crime and Punishment, under contractual conditions that would have crushed most writers. Now there is some kind of heroism. I would like to read a Victor Hugo novel about Dostoevsky writing Crime and Punishment and The Gambler. Henrik Ibsen’s Brand is from 1866, as well, about another defier of the cosmos. Brand, Raskolnikov, and Hugo’s hero – big characters in big stories. I do not believe I have read any English-language novels from the year. Wilkie Collins’s Armadale, George Eliot’s Felix Holt, and Elizabeth Gaskell’s Wives and Daughters, just barely unfinished, would be likely candidates for the Booker Prize, if there had been such a thing. Gaskell had never won the prize, beat by Thackeray, Dickens, and Trollope, so I think she picks this one up posthumously. I am just making this up. Like I care about prizes. Lip-smacking French verse. Those first three lines, those vowels, those nasalizations. Maybe the poem also means something. It is like The Toilers of the Sea turned into English verse. Swinburne was Hugo’s greatest English champion. Christina Rossetti’s second book, The Prince’s Progress and Other Poems seemed like a paler version of her brilliant first book, but I’ll note it, at least. In the United States, Herman Melville published Battle-Pieces and Aspects of the War, his debut as a poet and his first book in a decade, the first of all too few volumes of poetry. Even more surprising somehow is James Greenleaf Whittier’s nostalgic, ironic “Snow-Bound,” surprising because Whittier was generally such a bad poet, but one who occasionally wrote a great poem. Whether the torments inflicted by the poem on several generations of schoolchildren are to the demerit of Whittier I leave to the conscience of the individual reader. Those days are long past. Isn’t that 1816 Constable landscape pretty. 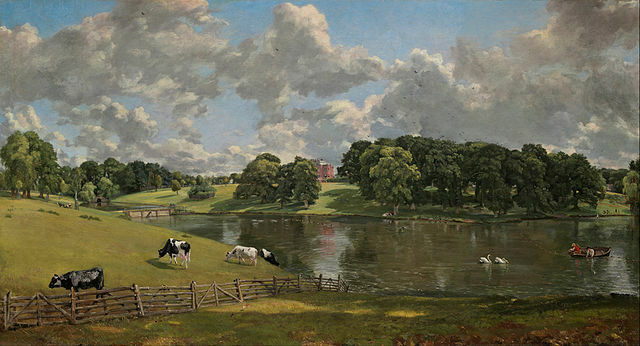 It’s Wivenhoe Park, Essex, for some reason now in Washington, D. C. 1816 was the Year without a Summer, the year of a worldwide volcano-induced deep freeze, even with the Napoleonic Wars over, a terrible year in Europe. It was a wonderful year for English poetry, with Shelley’s first great book, Alastor; or The Spirit of Solitude: and Other Poems, and Keats’s first published poems, including “On First Looking into Chapman’s Homer” (a book would come in 1817). Few knew it. Everyone knew about best-seller George Gordon Byron’s great year, with three big hits: the third canto of Childe Harold’s Pilgrimage (the post’s title is from stanza XVII), “The Prisoner of Chillon,” and one of his dumb Orientalist narrative poems, The Siege of Corinth, my personal favorite of his dumb etc. Horrible, violent, shocking poetry. I had meant to reread the more allusive and difficult Childe Harold’s Pilgrimage before writing this post, but picking up the Selected Poems I was sucked into The Siege of Corinth instead. Walter Scott published three books in 1816. To understand this silly story it is important to remember that he was a best-selling poet but published Waverley (1814) anonymously, then Guy Mannering (1815) as “By the Author of Waverley,” and now The Antiquary (1816) as by the same. The latter is the favorite Scott novel of many eminent writers, so I am glad I have read it. Waverley kicked off the craze for historical novels that continues to this day; The Antiquary is in many ways about historical novels. If only it were better. At this point, with three hit anonymous novels under his belt, Scott decided to play a prank. He retired “the Author of Waverley” and began a new series, with a new publisher, the Tales of My Landlord, which resulted in one short novel, The Black Dwarf and one long one, Old Mortality, published simultaneously. To extend the prank, Scott published vicious (anonymous) reviews of his own novels. Nevertheless, both books were hits, and readers with any sense of style knew they are by the Waverley writer. Old Mortality is Scott’s best novel, I think, along with The Heart of Midlothian (1818). It is about religious fanaticism, a topic of continuing relevance. The stakes are higher than in Waverley, the world more dangerous. The entire book is written like that, with few scenes, description, or even dialogue, but rather alternating movement and analysis. It is a kind of fiction I associate strongly with French literature. The Albertine sections of In Search of Lost Time are in this mode. The Empire is dust, and French literature is returning to life. The best books of the year! Always a lot of fun. In this case, three years: 1516, 1616, and 1716. Why not? How would I know which are the best books of those years? How many can I have possibly read? Right. So I just read the ones that centuries of other readers have told me are the best. I am just repeating what they say. My pick for 1516 is Orlando Furioso by Ludovico Ariosto, at this point just the first forty cantos – the whole big thing will not be finished until 1532 – which are thrilling enough. I’ll put Thomas More’s Utopia in second place. There, those are the two books from the year that I have read. Good ones. Still, look at the Wikipedia entry for “1516 in art.” Start with Grünewald’s Isenheim Altarpiece and work your way down. Wow. That’s where the creative energy is. My pick for 1716 is: I don’t know. Addison has shuttered the Spectator. Pope is busy with his Iliad. Swift is doing I don’t know what. Voltaire is writing plays. Congreve is not writing plays, having shifted entirely to politics. Marivaux is not yet writing plays. Defoe has not yet re-invented the novel. Of rigid Zealots to delicious Fasts. I should read the entire poem someday. The best book of 1616 – now that’s an easy one. It’s The Workes of Benjamin Jonson, Jonson’s First Folio, the inspiration for that later, more famous, First Folio. Nine plays, of which three – Volpone, Epicoene, and The Alchemist – are unique masterpieces. By “unique,” I mean no one else had ever written comedies quite like them. Two clusters of poems: Epigrammes, satirical; The Forest, lyrical. Then a number of masques and “entertainments,” also unusual texts, which I have only sampled. I mean, I have not read this book, just most of its contents. Complete plays in two volumes, complete poetry in another, masques in yet another. Of wood, of water: therein thou art faire. 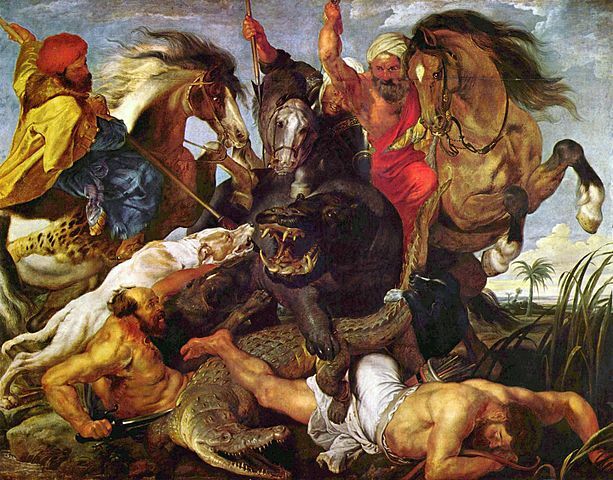 I picked an illustration from 1616, “The Hippopotamus and Crocodile Hunt” by Peter Paul Rubens that is preposterous nonsense, but I have seen it with my own eyes in the Alte Pinakothek in Munich. Huge, a monstrosity, but it has a lot going on. The Edward Thomas collection I read – The Annotated Collected Poems (Bloodaxe, 2008) – ignores the original publication of the pieces in Poems (1917) and Last Poems (1918) and so on and puts them all in the order in which they were written. There are a few poems in December 1914, close to two-thirds of the total in 1915, a third in 1916, and a few in January 1917. Thomas is killed in April, 1917. In effect, the poems are written over the course of two years. Because Thomas is a kind of nature poet – a rural poet – the sequence becomes that of a calendar. Months, holidays, seasons, agricultural activity, the movement of birds, the life-cycle of plants – that covers a lot of the poetry. The repetition of the sequence is especially interesting, as Thomas returns to a poem from a year ago, or for all I know completely forgets the earlier poem but returns to the same seasonal inspiration. I showed an example yesterday, two four-line poems written a year apart. Wouldn’t it be nice if I had taken the notes needed to pursue this idea? What a tangle up there, especially in the second stanza. The poet sees a jar hanging in a tree, used to trap and kill wasps, and thinks something like “Gee whiz, that jar is pretty in the moonlight,” and this chain of thought eventually comes forth. The jar is a thing of ugliness, a utilitarian death trap, but for a moment it is not just beautiful but “worth” more than anything on earth, or any star! In each of the three subsequent stanzas, the keeper hangs more animals from the “dead oak tree bough”. Each stanza ends with that line. The jar, so beautiful a year ago, returns to its role as a death trap, the wasps joining the weasels, crows, and “many other beasts” hanged from a tree branch. One may wonder if “The Gallows” is also a war poem. I wonder. As far as I can remember I had never read an Edward Thomas poem until recently. How sad for me. What a fine poet. What a sad story. Thomas worked as a hack writer – for example, “from 1900 to 1914 Thomas wrote ‘just over a million words about 1,200 books’” (Introduction, p. 12). Yee-ikes. His nature writing, or more accurately rural writing, is something well beyond hackwork. I read Thomas in The Annotated Collected Poems (ed. Edna Longley, Bloodaxe Books, 2008) where the annotations dwarf the hundred pages of poems, mainly because of the long samples of Thomas’s good prose. By good luck, Thomas became friends with Robert Frost just as North of Boston (1914) was published, and something in his creative organ was set off. He began writing poems, lots of them, a couple a week in 1915, then maybe one a week in 1916. For reasons that are a mystery, Thomas, at age 38 and this late in the war, volunteered to fight in France, where he was killed within a few months. His first book, Poems (1917), was in press when he died. His second was thus titled Last Poems (1918). Have gathered them and will never do again. ‘Only two teams work on the farm this year. In a few early poems, Thomas sounds like Frost, but he soon only resembles Frost conceptually, both poets writing dialogue poems and poems about the woods and so on, both, to me, looking like modern children of Wordsworth, like a century of poetry had been leaped. I will do another day of browsing through Thomas, just fir the excuse to quote more poems. save our treasures of beauty - Thomas Mann's "Death in Florence"
Long, long ago, when Thomas Mann was a living writer and his status in English literature was at a peak, a 1936 collection titled Stories of Three Decades, introduced by Mann himself, was the way to read “Death in Venice” and much else. Over time, Helen Lowe-Porter’s translations have been revised and replaced, and the stories republished in many (shorter) arrangements, often with the earlier stories neglected and the complex later, longer novellas pulled together. What I wanted to know was if there was anything in Stories of Three Decades that later anthologists had ignored, anything that I had missed. There is, and surprisingly it is a play, Fiorenza (1906), although likely a closet drama. I think the last act would work on stage, but otherwise I have doubts. Fiorenza a character in the play, the only woman, but also Florence – so this is another example of a German in Italy – in 1492, the day before Lorenzo de Medici dies. The last act is a confrontation between the dying Lorenzo, a demonstrably great man, especially in contrast to the pale idiots who surround him, and Friar Girolamo Savonarola, a fanatic, a madman, but very much alive, and on the verge of taking over Florence. Lorenzo is the representative of art, beauty, and the Classical spirit of the Renaissance. He recognizes, unlike the pale idiots, including his useless sons, that the Renaissance values he embodies are too abstract and empty. His sycophants flatter his poems – better than Dante! – and “divine origins. Not what a dying man needs to hear, even though Lorenzo embodies these values himself, however corruptly. Too corruptly. Some of the emptiness is a pagan hedonism. But Piero, the perfect courtier, is hardly the man for that job. The impulse to destroy these values, to burn books and slash art, as advocated and enacted by Savonarola and his followers, will have its moment of triumph. As I understood the last act, Mann is entirely on the side of Lorenzo, but suggests that the refusal to curb the excesses of the pursuit of beauty, the embrace of decadence, inevitably created the counter-reaction of Savonarola. The bonfires are not Lorenzo’s fault, but he is to blame for failing to imagine them. So, not such a surprise that Thomas Mann, in 1936, thought it a good idea to include this old curiosity among his other stories, whatever he had meant by it in 1906. German art, literature, and learning, however extraordinary, were no defense against modern Savonarolas. They instead needed to be defended. The Complete Works of Urmuz (tr. Miron & Carola Grindea) is a little Atlas Press chapbook sort of thing. Urmuz’s complete works seem to fit easily in 33 pages. A few of the summaries on his impressively thorough Wiki page are as long as the works themselves. Much of the prose is like this – nonsense, keeping enough coherence to give the illusion of a narrative. Urmuz is a pseudonym, a crazy name to go with crazy prose. The actual human was a judge and law clerk. He killed himself in 1923, when he was 40; I do not know the dates of specific pieces – the 1910s and 1920s. The world is falling about; so is language; so is meaning. The search will never end in life. Language and art undermine the search for truth as much or more than they assist. So Urmuz just plunges in. Tristan Tzara admired Urmuz. So did Eugène Ionesco. People turning into rhinos and so on logically follows from Urmuz. It would be useful for me to learn more about this artistic pathway between Romania and France. A week of writing about short books chosen as if at random, but no, all following some long-running Wuthering Expectations theme, I believe that is what I have in front of me this week. First up is The Book of Monelle (1894) by French oddball Marcel Schwob, in the Kit Schluter* translation from Wakefield Press, a book beloved by Symbolists, Dadaists, Surrealists, in general by artists with sympathy for conceptual art. And to imagine new art you must break its forebears. And thus new art seems a sort of iconoclasm. Monelle found me in the plain where I was wandering and took me by the hand. Then she reveals the prophecy of Modernist conceptual art to her true believers. The last part of the book returns to the religious aspect of Monelle. It is something like Dante’s New Life merging into Paradiso. Monelle dies but is resurrected etc. I am skeptical about this section. The middle of the book, though, is amazing. “The Sisters of Monelle.” It is a series of fairy tales and parodies of fairy tales, mostly with characters whose lives are ruined, or perhaps saved, by believing in fairy tales. Poor Ilsée, in “The Fated,” spends her life waiting for what she sees in her mirror. It comes, eventually. Poor Bargette, in “The Disappointed,” hitches a ride to the south of France on a barge, where she thinks she’ll find the South Seas – turtles, coconuts – even though the practical couple who operate the barge keep insisting that “’there’s going to be a bit of sun, but really, that’s all’” (35). Me, too! Schwob’s fairy tales are on the scary side. The sublime, as readers of Wuthering Expectations well know, is the mixture of beauty and fear. * A good interview with the translator at 3:AM Magazine; another at The Paris Review. A Doppelgänger (1886), the novella in Denis Jackson’s recent translation that is new to English, is a shocker, not like anything else I have read by Theodor Storm. It is about the life and sufferings of an ex-convict, John Hansen, in Husum, walking around where I have walked. He suffers because of the prejudices of his neighbors, the economics conditions of his time, but also due to his own psychology – his guilt, his lack of impulse control, that sort of thing. He is in some ways a sympathetic figure, but at his worst he is violent and dangerous. The domestic abuse in the story is the most shocking part. Storm was for many years a judge, and much of the detail of the story must have come from his courtroom. It was no surprise to see Jackson write that A Doppelgänger is “considered even today to be the first Naturalistic literary work in Germany” (188). Meaning Naturalism as a subject, a genre, the unsentimental literature of the poor and downtrodden as in Zola’s Germinal, not anything to do with style. For Storm, though, the style is pretty plain. Less plain language is reserved for special occasions, and for an uncanny old well that for some reason torments John. You know someone is going to end up in that well. You can pretty much guess who. She has escaped her early poverty, now living in a world of “yellow irises blooming at its [a pond’s] edge in a profusion I had never seen before” (112). Strangely, the central story is not a discovered document or memory of the narrator, but a vivid fantasy. He imagines the life of the father of the woman in the woods, tempered by his few childhood associations with the character, one of which involves the well. In a directly anti-Naturalism move, the narrator acknowledges that he’s made it all up. “’Hm,’ said the level-headed man [the woman’s husband], his eyes resting on me trustingly. ‘But that’s poetry’” (157). However far from his usual work, still Theodor Storm, in other words. How lucky we are to have these new translations. The great Theodor Storm translator Denis Jackson published his fifth volume of Storm’s novellas recently – A Doppelgänger with Aquis submersus. The latter is also available in the old James Wright collection, The Rider on the White Horse; the former is new to English. No offense meant to the actual translations of Wright, but the editions Jackson produces are ideal. Jackson loves the North Frisian landscape and culture as much as he loves Storm, so his research on the villages and landscape and their connections to Storm’s fiction are worth seeing for their own sake. I have been to Husum, Storm’s home, visited his grave and all that. I have never been to a place more tangled with the works of an author. Thomas Hardy’s Wessex is a useful comparison, but Wessex is much bigger, with novels set over a much larger space. In Storm’s stories – in the two I just read – the characters keep walking past places I have been in Husum. They keep visiting places that now have plaques telling me that this building stands on the site of the Aquis submersus house. This is the first line of Aquis submersus (1876), and a good example of why I associate him with W. G. Sebald, who I assume knew his work well. Although Storm is an author full of hope and joy, openly striving for beauty, his fiction has a similar sense of historical entropy. He lived in a landscape where once in a while a North Sea hurricane destroys everything, literally smashing islands into pieces and drowning entire cities. Storm is well aware of the natural history of destruction. On the other hand, that garden, where I have been, is now best known for its spectacular spring crocuses. In both of these stories, the “present” is idyllic, but the past is tragic. The narrator actually describes the entire contents of a church, with Jackson, in his notes, telling me either where I can visit each artifact or when it was lost, but most importantly this painting, inscribed “1666” and “C. P. A. S.”, perhaps Cupla patris aqua submersus – “Through the fault of the father drowned.” The bulk of the story is a fortuitously discovered manuscript written by the painter telling the tragic story of that painting and that inscription. I barely know a thing about George Bernard Shaw, most of what I know is likely wrong, and now that I see that I took the dumbest notes on Major Barbara (1905), but how will I learn if I stay silent I say to myself. Major Barbara is a major in the Salvation Army. Act II takes place at a Salvation Army shelter. Great stuff. Barbara’s father, Andrew Undershaft, is England’s greatest armaments manufacturer. Act III partly takes place at his gigantic manufacturing plant, which is something like the giant Krupp plant as if it were run by Robert Owen. UNDERSHAFT [stopping to smell the bouquet]. Where did you get the flowers, my dear? LADY BRITOMART. Your men presented them to me in your William Morris Labor Church… Yes, with Morris’s words in mosaic letters ten feet high round the dome. NO MAN IS GOOD ENOUGH TO BE ANOTHER MAN’S MASTER. The cynicism of it! UNDERSHAFT. It shocked the men at first, I am afraid. But now they take no more notice of it than of the ten commandments in church. Undershaft is such a perfect cynic about the effects of his products on the world – “Here I am, a profiteer in mutilation and murder” – that he is in practice perversely sincere, as much of a Utopian reformer as his daughter Barbara. Much of the plot is about Undershaft’s attempt to find a successor to run the factory – a fairy tale where the prize for the plucky peasant hero is a dynamite plant – and I kept detecting the idea, never stated by Shaw that I noticed, that the heir really should be Barbara, even if her ideals are completely different. She and her father share the impulse to organize the world. Maybe that is what happens at the end, come to think of it. Her husband gets the business, but he is an idiot, and a cynical cynic, not a sincere one, a classicist who bangs the bass drum in the Salvation Army only because he wants to marry the wealthy Barbara. The “artificial and self-suppressed” part is accurate, at least. Please note the appearance of the god of satyrs and fauns, like an Edwardian timestamp. Perhaps a reader can detect some irony in the play’s central conflict. Strangely, Shaw was criticized for attacking the Salvation Army, as he describes in the long preface to the play. As if he were in favor of the cannons and warships instead. Major Barbara is an argument against the illusion of purity. “He must either share the world’s guilt or go to another planet” (Preface). “He” being anyone, everyone. The first act of the play is a drawing room comedy as funny as the others by Shaw I have read recently, Candida (1894) and You Never Can Tell (1896). Shaw is expert with upper-class prigs and idiots. But the rest of the play is bigger, more ambitious. More in line with my received view of Shaw, the one I carried around for years, not completely mistaken but badly incomplete.